Figure 4.1. Schematic of serum protein electrophoresis. The approximate position of polyclonal immunoglobulins in normal serum and the anode (+) and cathode (-) are indicated. Figure 4.2. Capillary zone electrophoresis. (A) Normal serum. (B) Monoclonal protein peak in γ-region, indicated by an arrow. (These figures were originally published in , reproduced with permission from Taylor & Francis Group). Serum protein electrophoresis (SPE) is performed in agarose gels, resulting in the separation of serum proteins according to their size and charge and producing two major fractions: albumin and globulins. Albumin is the most abundant serum protein and forms a dense band close to the anode. 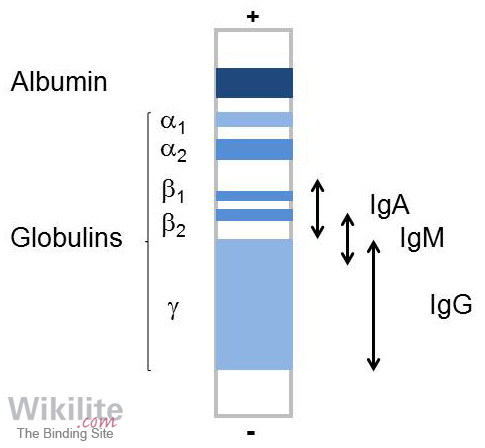 The globulin fraction is subdivided into five regions, each containing several serum proteins. These are α1, α2, β1, β2 and γ, with the γ-region being closest to the cathode (Figure 4.1). After proteins have been separated, they are fixed in the gel with an acid fixative and generally stained with Coomassie Brilliant Blue or Amido Black. Stained gels may be examined by eye and are often scanned with a densitometer to produce an electrophoretogram. This is a digital interpretation of the stained gel and is similar in appearance to electrophoretograms generated by capillary zone electrophoresis (CZE; Figure 4.2). Monoclonal proteins may appear as a peak in any region on the electrophoretogram, and may co-migrate with other serum protein bands. Serum monoclonal proteins are typed by sIFE (or immunosubtraction; Section 4.3), while the concentration of each band is determined by scanning densitometry of the SPE gel in combination with serum total protein measurements. Monoclonal protein quantification is a subjective technique, in which the operator demarks the edges of the peak (typically using a perpendicular drop ). Measurements of monoclonal proteins that migrate in the γ-region may be overestimated when polyclonal immunoglobulins are present at the same position. IgA monoclonal proteins typically migrate in the β-region, and may also present difficulties for accurate quantitation. These issues and other challenges are further discussed in Sections 17.4 and 18.3.5. Other features suggestive of a monoclonal gammopathy may be detected by SPE e.g. hypogammaglobulinaemia (identified by reduced staining in the γ-region). If a monoclonal gammopathy is suspected, further investigation is warranted, including serum immunofixation electrophoresis (sIFE; Section 4.3.1) .